The two trials of ousted Islamist president Mohamed Mursi for espionage and prison escape charges were “politically motivated” and “compromised by due process violations”, Human Rights Watch said. Mursi was sentenced to death in the prison escape trial on Tuesday, alongside 98 others. They are accused of escaping the Wadi al-Natroun prison during the January 2011 uprising. Brotherhood Supreme Guide Mohamed Badie, his deputy Rashad Bayoumi, and leading Brotherhood figures Saad al-Katatny and Essam El-Erian were also handed death sentences for the prison escape case. 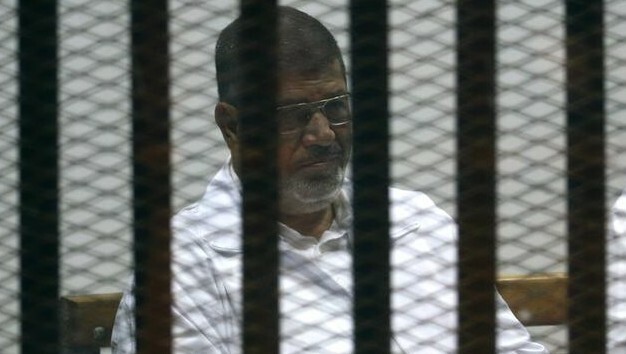 Mursi and Badie were also both sentenced to life in prison for an espionage case on Tuesday. Sixteen were sentenced to death in the espionage case, including Brotherhood figures Khairat al-Shater and Mohamed El-Beltagy. HRW condemned the “series of mass trials” they said Egyptian authorities have conducted since 2013, involving hundreds of Brotherhood members. The organisation noted that Egypt’s criminal law requires establishing “individual criminal guilt” for conviction, adding that there were no indications of such establishment in the cases Mursi faced. In the prison break case, the prosecution relied on the testimony of 43 people, “most of them Interior Ministry security officers,” HRW said, citing the prosecution’s case summary. The organisation also criticised the timing of the trials, noting that both Mursi and other Brotherhood members were only charged after the former’s removal from power, though both crimes dated back two years earlier. This and “the failure to investigate any other party for the prison breaks or alleged conspiracy – such as Sisi and other current and former military officers …” suggests the cases are “politically motivated,” HRW said. Since his removal in July 2013, Mursi has faced multiple charges in five trials. The former president still faces charges in a separate espionage trial and for insulting the judiciary. His ouster was also followed by the arrests of dozens of Brotherhood leading figures. Egypt listed the Brotherhood as a terrorist organisation in December 2013 and insists it is behind the wave of militancy which has targeted security personnel since July 2013.